For Watermelon Salsa: In a medium bowl, combine watermelon, tomato, green onion, basil, lime juice and pepper. Toss to coat. Set aside. To serve, slice grilled sausages. 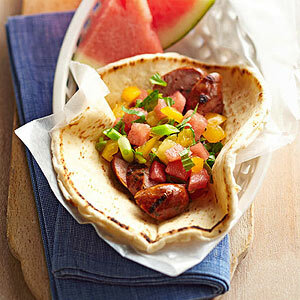 Divide sliced sausage and Watermelon Salsa among toasted flatbreads.